Hypercom’s 4230 is a unique mobile terminal that offers GPRS connectivity in a compact design and incorporates a removable, extra long-life battery for extended use between charges. This truly powerful device has converted all the best-of-breed features into a mobile device using common software applications, user interface and supporting systems. Memory Flash: 8MB. SDRAM 16MB. SRAM: 512KB. SRAM Backup: 5 year battery. 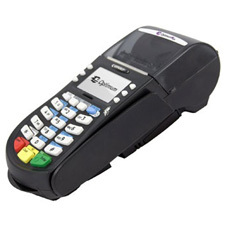 Magnetic Card Reader: Bi-directional, Tracks 1, 2, 3. 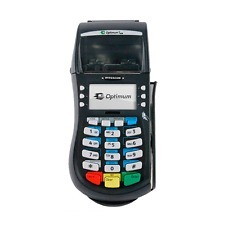 Chip Card Optional; EMV4.1 Level 1 & 2, ISO 7816. Up to three SAM slots. Printer: SureLoad clamshell design, drop-in loading, thermal technology, 384 dots per line. 15+ lines per second. Paper Roll: 2.24", 50mm diameter. Security: PCI PED approved. Triple DES: ANSI X9.52, PIN-ANSI X9.8, MAC-ANSI X9.9 Part 1-ANSI X9.24. Communications: Primary GSM/GPRS. Modem V.34/33 6Kbps via dockin station. Ports RS-232 for peripherals..
Keypad: 19 buttons, PCI PED approved; water splash-resistant. 6 navigational buttons, ADA-style markings. Display: FSTN LCD with graphics. 160x 80 resolution. Power: AC: 100-240V, 50/60 Hz. DC: 7.5V, 2.8A. Footprint: 3.62 in (w) x 8.24 in (l) x 2.59 in (h). 91.95 mm (w) x 209.3 mm (l) x 65.79mm (h).